The Python API is a script that allows access to your MOLGENIS data from python. It is available on every MOLGENIS with version 1.14.0 and up on the URL http://molgenis.mydomain.example/molgenis.py. As an example, let&apos;s create a plot for publicly available ASE data available on https://molgenis56.target.rug.nl/. For a description of the data, take a look at http://molgenis.org/ase. Download the python api from a molgenis server, for instance https://molgenis01.target.rug.nl/molgenis.py and save it in molgenis.py. This imports the molgenis package. This retrieves the top 1000 rows from the ASE entity. 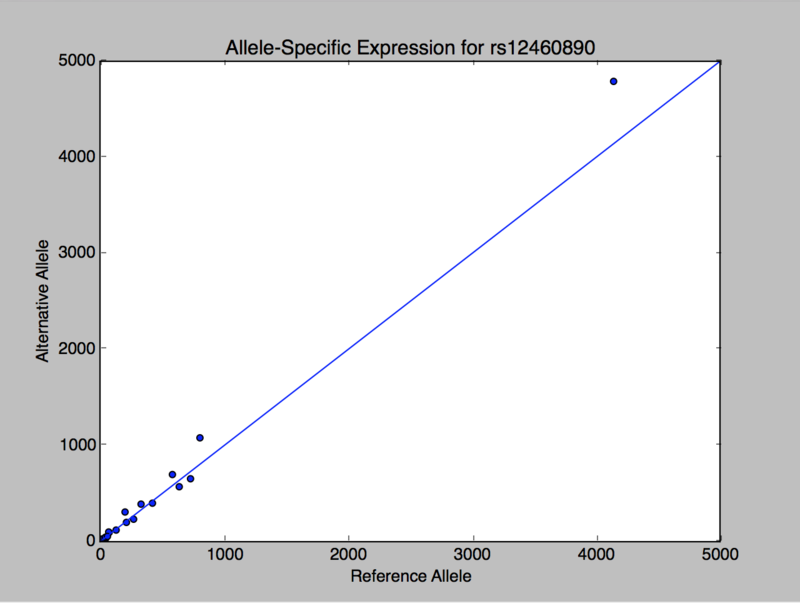 This SNP has a mild but significant allele-specific expression, based on expression counts in 21 samples. Let&apos;s plot the expression counts in these samples in a scatter plot. And add a line for the non-specific expression.